If you don't know Telwin, please head to their site (http://www.telwin.com/) and discover which kind of product they have in portfolio. Telwin is Italian based productor from more than 50 years of the finest welders, plasma and more. Their market is Automotive, Industrial, Professional and Consumer, and if you know some of their products, you know the high quality and reliability: especially in the automotive market (you know for sure some titled Italian brand, Ferrari, Maserati, Lamborghini), so you can imagine the high standard the Italian industry professional requires also from these products. 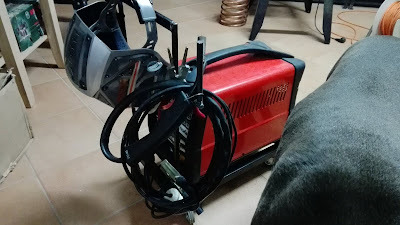 I own this model from lot of years (more than ten if I could remember), I could say I learned to weld with this machine, without external help. In fact this is the most remarkable feature I would like to highlight from this consumer-grade machine: forgive you for any error. I never had any trouble, except the fact I had to learn how to setup correct polarity, speed of wire, current setting, in relation to the work. In these years I learned how to improve my skills with wire welders, improving also technical and cleanliness of results. 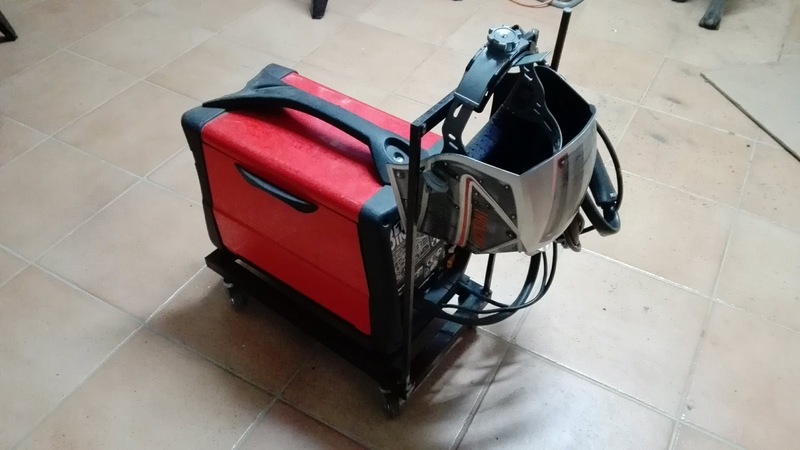 This little machine, i bought without any expectation from a big of the house improvement distribution chain, is capable to deliver 105 Ampere with duty cycle of 15% (this mean that you can weld with this current for the 15% of time) and 50 Ampere with duty cycle of 60%. What can you expect with these characteristic? Lower range can solder 0.6 mm sheet metal without distorting so much, with upper range, I created a L shaped steel frame with thickness of 10mm! I learned also you can fill fill easily holes or separations between pieces of metal. You can solder with gas or without gas, I prefer without gas with animated wire, because I don't want to complicate my weldings with Gas refurbishment, and I found with NoGas the results are more than acceptable: simply fill with a spool ranging from 0.6mm to 1.0 mm and forgive it. Another characteristic I would like to highlight is that this machine can accept 5kg spool of wire. This beauty can solder Aluminium, Steel, Inox with GAS (mix of CO and Argon) and Steel without GAS (animated wire, or wire with flux inside). Plastics are durable, but most of the machine is made of well power painted metal. 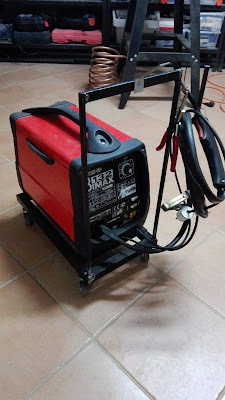 What I could say is not really a portable welder (21 Kg) so I built a small cart, quite different from the ones you can find in the market, because is really simple and designed for earth work (the welding gun start from a lower height), but occasionally you can weld on a higher surface like on a table. For sure you experimented the dross problem on the tip, especially if as me you are not so expert and use animated wire. Cleaning the drosses is really easy and every consumable tip last from my experience at least 2Kg of wire. Replacement is easy and cost nothing. I never had to change the guard of the tip, always cleaned with metal brush. Taking a low center of gravity, allowed me to pull it in the shop without worry to overturn it. A big improvement a simple hook to roll over the cables.) Spot-welding can be carried out on overlapped metal sheet with a maximum thickness of 0.8 mm. 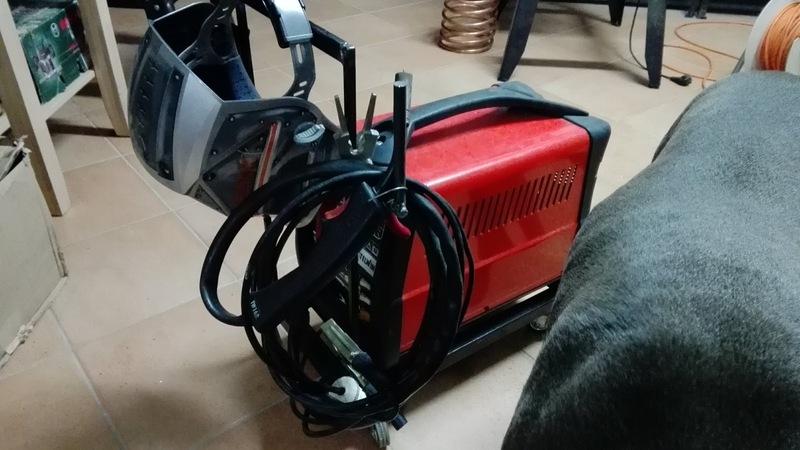 How can you read, I'm very satisfied of this product, despite I tried some modern eletronic chinese product, this welder for me is unsurpassed in quality and price.